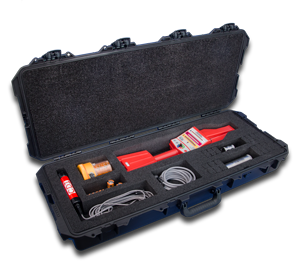 CDI's TRAXALL 500 water and wastewater plug tracking kit provides everything needed to meet and exceed the San Antonio Water System (SAWS) Standard Specifications for Construction and other similar pipe plug tracking specifications. The TRAXALL X300 and X400 low frequency radio transmitters are durable stainless steel cylinders with integrated pressure switches which activate the transmitter upon loss of plug pressure. 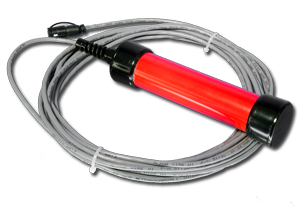 These transmitters' pressure switches can easily be configured to activate when the pressure falls below any pressure between 8 to 100 psi. 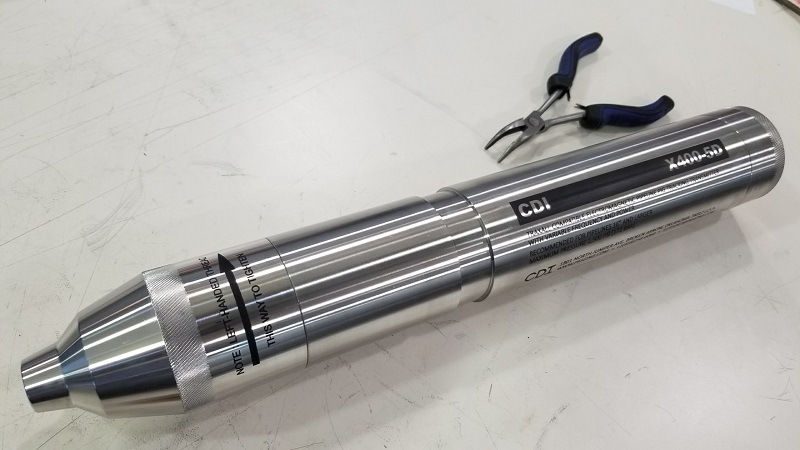 To use the transmitter, simply provide a connection from the pipe plug's pressurized bladder volume to the provided 1/4" NPT threaded port. Once batteries are installed, the low frequency radio transmitter it will begin transmitting a pulsing signal until the plug is inflated. Once installed and inflated, the bladder pressure will cause the pressure switch to engage, halting the pulses from transmitter. Should the plug experience a loss of pressure the pressure switch will disengage and the transmitter will begin pulsing for a minimum of 1,000 hours. Our largest and most powerful transmitter, the X400-5D, will run continuously for 1,968 hours. 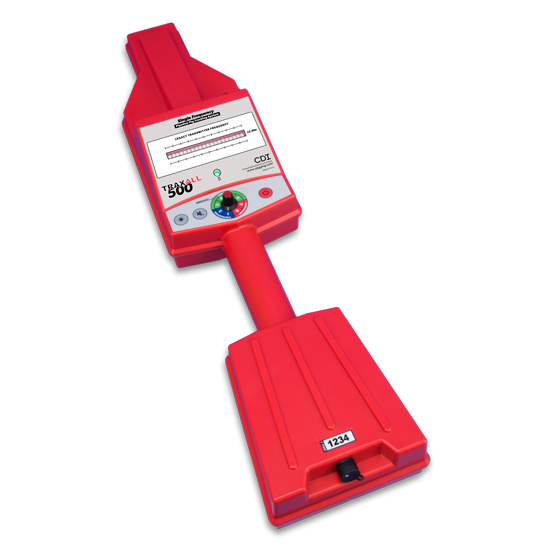 The simple and intuitive TRAXALL 500 and 501 low frequency radio receivers allow for tracking plugs through an adjacent system should a plug become lost or shift position. Pulsing signals from our low frequency TRAXALL radio transmitters can be detected up to 77 feet away on alkaline batteries and up to 110 feet on lithium batteries. 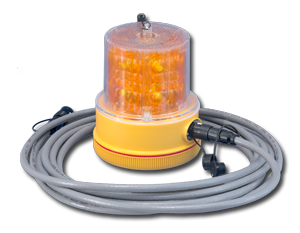 The transmitter and receiver pair do not require line-of-sight and transmit with minimal loss of range through concrete piping, rebar, water, soil, asphalt and other common construction materials. The system easily transmits even through steel pipelines with minimal loss in range due to attenuation of the signal by the steel. 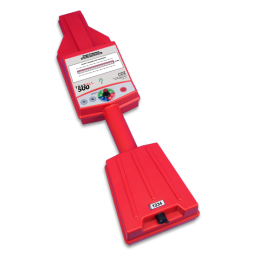 Since a line-of-sight is not required, the kit can be used to track and pinpoint the location of a shifted or lost plug through long distances, bends and other obstructions. Simply pick up our lightweight TRAXALL 500 radio receiver and walk above the line looking for the easily recognizable pulse pattern of our low frequency radio transmitters. Once the transmitter is located on the surface, a stake or paint mark can be made for excavation or other retrieval methods. with a variety of uses for tracking and locating pipe plugs.